It took seven months for the world’s most powerful military alliance – with a combined military spending of just under $1 trillion per year – to fully destroy the Jamahiriya (a state with a population the size of Wales) and it took a joint British-French-Qatari special forces operation to finally win control of the capital. 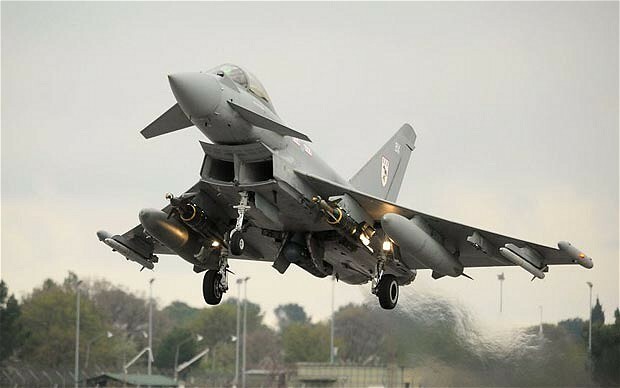 In total, 10,000 strike sorties were rained down on Libya, tens of thousands killed and injured, and the country left a battleground for hundreds of warring factions, armed to the teeth with weapons either looted from state armouries or provided directly by NATO and its allies. Britain, France and the US had led a war which had effectively transformed a peaceful, prosperous African country into a textbook example of a ‘failed state’. Yet the common image of Libya in the months and years leading up to the invasion was that of a state that had ‘come in from the cold’ and was now enjoying friendly relations with the West. Tony Blair’s famous embrace of Gaddafi in his tent in 2004 was said to have ushered in a new period of ‘rapprochement’, with Western companies rushing to do business in the oil-rich African state, and Gaddafi’s abandonment of a nuclear deterrent apparently indicative of the new spirit of trust and co-operation between Libya and the West. Yet this image was largely a myth. Yes, sanctions were lifted and diplomatic relations restored; but this did not represent any newfound trust and friendship. Gaddafi himself never changed his opinion that the forces of old and new colonialism remained bitter enemies of African unity and independence, and for their part, the US, Britain and France continued to resent the assertiveness and independence of Libyan foreign policy under Gaddafi’s leadership. The African Oil Policy Initiative Group (AOPIG) – an elite US think tank comprising congressmen, military officers and energy industry lobbyists – warned in 2002 that the influence of “adversaries such as Libya” would only grow unless the US significantly increased its military presence on the continent. Yet, despite ‘rapprochement’, Gaddafi remained a staunch opponent of such a presence, as noted with anxiety in frequent diplomatic cables from the US Embassy. One, for example, from 2009, noted that “the presence of non-African military elements in Libya or elsewhere on the continent” was almost a “neuralgic issue” for Gaddafi. Another cable from 2008 quoted a pro-Western Libyan government official as saying that “there will be no real economic or political reform in Libya until al-Gaddafi passes from the political scene” which would “not happen while Gaddafi is alive”; hardly the image of a man bending to the will of the West. Gaddafi had clearly not been moved by the flattery towards Libya (or “appropriate deference” as another US Embassy cable put it) that was much in evidence during the period of ‘rapprochement’. Indeed, at the Arab League summit in March 2008, he warned the assembled heads of state that, following the execution of Saddam Hussein, a former “close friend” of the US, “in the future, it’s going to be your turn too…Even you, the friends of America – no, I will say we, we the friends of America – America may approve of our hanging one day”. So much for a new period of trust and co-operation. Whilst business deals were being signed, Gaddafi remained implacably opposed to the US and European military presence on the continent (as well as leading the fight to reduce their economic presence) and understood well that this might cost him his life. The US too understood this, and despite their outward flattery, behind the scenes were worried and resentful. Given what we know now about what has taken place in Libya – both during the so-called ‘rapprochement’ between 2004 and 2011, and from 2011 onwards – it is appropriate to take stock of this experience in order to see what lessons can be learned about the West’s approach to its relations with other countries of the global South. As I have shown, the so-called rapprochement period was anything but. The US continued to remain hostile to the independent spirit of Libya – as evidenced most obviously by Gaddafi’s opposition to the presence of US and European military forces in Africa – and it now seems that they and the British used this period to prepare the ground for the war that eventually took place in 2011.
therefore ‘under the radar’ of the foreign ministry and central government. He was also able to speed up the prisoner release programme that led to the release of the Libyan Islamic Fighting Group insurgents who ultimately acted as NATO’s shock troops during the 2011 war. The head of the LIFG – Al Qaeda’s franchise in Libya – eventually became head of Tripoli’s military council whilst Abdul-Jalil himself became head of the ‘Transitional National Council’ that was installed by NATO following the fall of the Jamahiriya. Another key figure groomed by the US in the years preceding the invasion was Mahmoud Jibril, Head of the National Economic Development Board from 2007, who arranged six US training programmes for Libyan diplomats, many of whom subsequently resigned and sided with the US and Britain once the rebellion and invasion got underway. Finally, the security and intelligence co-operation that was an element of the ‘rapprochement’ period was used to provide the CIA and MI6 with an unprecedented level of information about both Libyan security forces and opposition elements they could cultivate that would prove invaluable for the conduct of the war. Lesson one therefore is – rapprochement, whilst appearing to be an improvement in relations, may actually be a ‘long game’ to lay the groundwork for naked aggression, by building up intelligence and sounding out possible collaborators, effectively building up a fifth column within the state itself. This does not mean it should not be done; it merely means it should be approached with extreme caution and scepticism on the part of states of the global South. It should be understood that, for the West, it is almost certainly a means of waging ‘war by other means’, to paraphrase Clausewitz. This is particularly pertinent to the case of Iran, a current recipient of the poisoned chalice that is ‘warmer relations’ with the West (although this ‘thaw’ may yet be scuppered by a Zionist Congress with no patience for the long game). I try to avoid the term ‘regime change’, as it implies a change of one ‘regime’ (usually understood as relatively functional and stable state, albeit a potentially ruthless one) to another. In the recent history of so-called ‘regime changes’ by the West, this has never happened. In Iraq, Afghanistan, and Libya, ‘regimes’ have not been replaced by other ‘regimes’, but have rather been destroyed and replaced instead by ‘failed states’, where security is largely non-existent, and no single armed force is strong enough to constitute itself as a ‘state’ in the traditional sense of establishing a monopoly of legitimate violence. This in turn leads to further societal and sectarian divisions emerging, as no group feels protected by the state, and each look instead to a militia who will defend their specific locality, tribe or sect – and thus the problem perpetuates itself, with the insecurity generated by the presence of some powerful militias leading to the creation of others. The result, therefore, is the total breakdown of national society, with not only security, but all government functions becoming increasingly difficult to carry out. In Libya, not only were various sectarian militia such as LIFG armed and empowered by the US, Britain and France during the war against the Jamahiriya, but their power was then boosted by the new NATO-backed government that followed. In May 2012, Law 38 effectively granted impunity to the militias, making them immune for prosecution not only for crimes committed during the war against the Jamahiriya (such as the well documented slaughter of immigrants and black skinned Libyans), but also for ongoing crimes deemed “essential to the revolution”. This law effectively gave a free pass to the militias to murder their real or imagined opponents, building on the boost to the authority that they had already gained two months earlier. In March 2012, many of the militias had been incorporated into a new police force (the Supreme Security Committee) and a new army (the Libya Shield) – not only legitimising them, but providing them with further material resources with which to continue their violence and their ability to impose their will on the country’s legal – but largely powerless – authorities. Since then, the new militia-run police force has led violent campaigns against the country’s Sufi minority, destroying several shrines in 2013. The same year, they also besieged several government ministries, in a (successful) attempt to force the government to pass a law criminalising supporters of the former government (a move which will jeopardise security yet further by barring hundreds of thousands of experienced officials from government work). The Libyan Shield, meanwhile, carried out a massacre of 47 peaceful protesters in Tripoli in November last year, and later kidnapped the Prime Minister Ali Zeidan. They are currently involved in a war to oust the newly elected government that has likely cost the lives of thousands since it started this June. This is not ‘regime change’ – what NATO has created is not a new regime, but conditions of permanent civil war. Many in both Libya and Syria now regret having acted as NATO’s foot soldiers in sowing the seeds of destruction in their own countries. Anyone expecting future ‘regime change’ operations conducted by the West to result in stable democracies – or even stable sharia theocracies for that matter – need look no further than Libya for their answer. Western military power cannot change regimes – it can only destroy societies. Although the war on Libya was begun under the authorisation of UN Security Council resolution (1973), it is important to note that this resolution only authorised the establishment of a no-fly zone and the prevention of Libyan state forces entering Benghazi. This was achieved within days. Everything that NATO did subsequently was beyond the terms of the resolution and therefore illegal; a point that was made vehemently by many who had supported (or at least not opposed) the resolution, including Russia, China, South Africa and even elements within the Arab League. Regardless of the pretext, once the US and UK are militarily involved in a country on their hit list, they should not be expected to stick to that pretext. For them, UNSC 1973 allowed them to bomb Libya. The precise legal goals became immaterial – once they had been given the green light to bomb, they were not going to stop until the Jamahiriya was destroyed and Gaddafi dead, whatever the original legal reasoning that allowed them to go in. A useful analogy here is that of a robber going to an old lady’s house posing as a gas man. Once he is inside, he is not going to stick to reading the gas meter – he is going to rob her house. Obviously, this lesson is most pertinent in Syria, where the US, likely to be soon joined by the UK, are conducting airstrikes ostensibly ‘to destroy ISIS’. Given their avowed long term aim to topple the Syrian state, and their only recent (and arguably half hearted at best), conversion to seeing ISIS fighters as enemies rather than valiant freedom fighting allies, this is to be taken with a large pinch of salt. A little noted aspect of the Libyan war (which has, however, been covered in detail by Horace Campbell) is the fact that the capital, Tripoli, was taken largely by Qatari ground forces co-ordinated by French and British special forces (in direct contravention of UNSC 1973). Indeed, no part of Libya was held by the rebels alone for any significant length of time without massive NATO bombardment of Libyan state forces; after the first three weeks, once the Libyan army got on top of the insurgency, not a single battle was won by the rebels until NATO started bombing. Even then, rebels could generally only take towns if NATO forces had completely destroyed the resistance first – and would still often be chased out again by the Libyan army a few days later. This is despite the fact that many of the Misrata militias were under the direct command of British special forces. This state of affairs meant the taking of the capital was always going to be deeply problematic. The solution was Operation Mermaid Dawn – an invasion of Tripoli in late August by Qatari ground forces, French intelligence and the British SAS, preceded by several days of intensified airstrikes. Whilst it is true that local collaborators joined in once the invasion was on the way, and indeed some rebel units had prior knowledge, the reality is that the fall of Tripoli was overwhelmingly a foreign planned and executed operation. This is all highly relevant to the situation in Syria right now. For most of this year, momentum in the Syrian war had been on the side of the government, most obviously in its retaking of the former rebel stronghold of Homs in May. Whilst this momentum was to some extent reversed by ISIS following its gains in Iraq, nevertheless it remains clear that hopes of a rebel victory without a Western air campaign seem unlikely. What Libya shows, however, is that even WITH air support, rebel militias are unlikely to achieve victory without an accompanying ground occupation. In Syria’s case, this may be even more necessary, as switching airstrikes from ISIS to Syrian government forces will be far more difficult than in Libya given the sophisticated S-3000 anti-aircraft missiles provided by Russia last year. This may make ground occupation the more viable option. With Western media attempting to put pressure on Turkey to mount a ground occupation, there may be hopes that Turkish forces will play in Syria the role that Qatari forces played in Libya. The Libya war opened the eyes of many – or should have. But the overriding lesson – if it needed reiterating – should be the realisation that the US, the UK, France and their allies will stop at nothing, including even the imposition of total societal collapse, in order to attempt to reverse their declining global economic position through military destruction. This is the reality behind all talk of protecting civilians, humanitarianism, and democracy promotion, and all Western military intervention should be seen in this light. Dan Glazebrook is author of Divide and Ruin: The West’s Imperial Strategy in an Age of Crisis. A shorter version of this article first appeared in Middle East Eye.